In recent times, many high-profile data breaches can be traced to hackers exploiting known, unpatched vulnerabilities. Had these targets maintained the patches in their systems, they would have stayed out of the headlines. However, keeping systems patched is anything but simple. Unfortunately, the more systems there are, the harder it is. Patching is labor intensive: Manually updating a server or workstation is a time-consuming process that often requires multiple reboots, especially if it has been several months (or even years) since that machine was last updated. Although multiple machines can be manually updated simultaneously, these updates typically have to be performed outside of business hours in order to avoid excessive downtime. For many organizations, this means paying someone overtime to do routine maintenance. This makes patching not only labor intensive, but expensive. 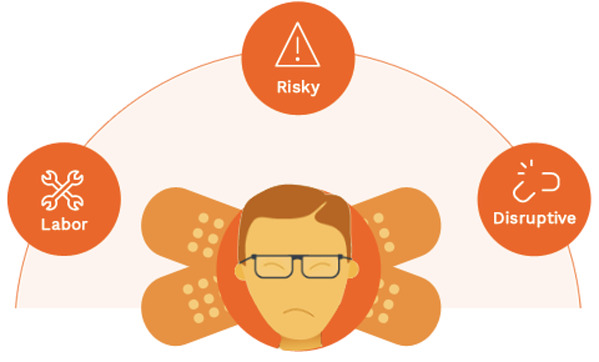 Patching is risky: No matter the preventative measures, some patches are bug-ridden. Although some operating system patches may be bug-free in and of themselves, they may not cooperate with certain applications, especially custom ones or system configurations. Bugs and incompatible patches can result in system crashes, which is bad news for your mission-critical systems. To avoid system crashes, one suggestion is to test patches in a test environment beforehand. Though a test is beneficial, it adds to the effort and labor required to maintain an updated system. Patching can be disruptive: When patching goes awry, it’s detrimental to your workplace. It has the ability to crash systems for an unforeseeable amount of time. Even when patching goes smoothly, critical business systems will be offline, often for an unsavory period of time. Extensive planning and meticulous coordination is required to keep business running in any case, again adding to the effort that results from patching. After reading about the drawbacks of patching, you may be hoping there is a better way. Fortunately, there is! It’s called Centralized Patch Management. 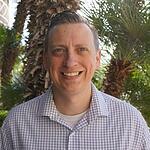 Automated patching: Say goodbye to labor-intensive manual patching (or at least most of it)! Most servers, workstations, and applications can be patched automatically by using remote systems management tools. Pre-deployment validation: Especially in the case of cloud-hosted systems, patch management services can verify that patches will not cause system or application crashes by testing them on “snapshot” copies of your critical servers. They perform the tests for you, but without the effort and labor. Schedule management: Servers and workstations can be patched on a staggered schedule so they aren’t all being updated at once. Business-critical servers can be scheduled outside business hours to minimize the impact of its downtime to the organization. Additionally, tricky or high-risk servers (such as clustered SQL Server database servers) can be excluded from automated patching and patched manually instead. 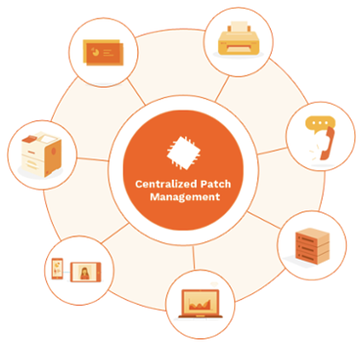 Monitoring: Centralized patching systems can provide instant alerts if an OS or application patch fails on a specific machine (or on many machines) and if a machine fails to reboot or respond after patch installation. Easy and fast rollback if problems arise: For cloud environments, even when problems do arise in the production environment, restoring service is as simple as re-deploying the previous snapshot. Reduced or eliminated downtime: With patch management services in the cloud, servers can be configured so that there is a backup server. While the primary server is being patched, the backup can control business-critical tasks, resulting in little or no downtime. Patch management services represent only one component of a comprehensive managed security services solution. Removing the task of sustaining updated IT systems from your IT staff allows them to focus on more rewarding pursuits, such as developing and deploying innovative solutions for taking your business to the next level.